We are a leading Manufacturer of stand up pouches from Ghaziabad, India. Stand Up Pouches made available by us are well recognized in the market for their self supporting bottom gussets and can be made available by us in option of with/without airtight inter-locking zipper system. 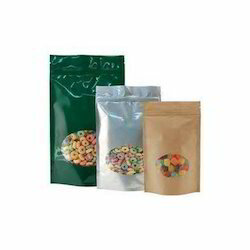 All our supplied Stand Up Pouches are best in quality and made by our professionals by using optimal quality raw material that is completely safe to edible products.These pouches offer high visibility on display shelf in various shopping malls.